Those who have been following this blog for a while know how much I love everything sweet. Especially chocolate. When I went vegan (almost 10 years ago!) Ritter Sport had a couple of vegan options in Germany. Their semisweet chocolate (50% was vegan) and so were their marzipan and peppermint bars. When they changed the ingredients of the peppermint bar and unveganised it by adding butterfat, I wrote an angry blog post. A while later I switched to organic, fair-trade chocolate anyway. Over the years you can find a huge variety of chocolates at German health food stores. Plain dark chocolates, others made with rice syrup, white chocolates and lots of varieties made with nuts and fruits, too. With all these to choose from I have to admit that I haven’t eaten a single piece of Ritter Sport chocolate in a couple of years. This year in August the company introduced two new bars, which for the first time are labeled as vegan. They contacted me and asked me if I wanted to review them in exchange for a package filled with their new chocolates. And how could I say no to that? The new bars are similar to two varieties they already had on the market: one with roasted almonds and one with roasted hazelnuts. For their vegan version they switched out the annoying butterfat with hazelnut mass. Also they made the bars just a bit more vegan by adding popped amaranth and popped quinoa. At least that is what I thought at first. These days every proper vegan products needs to have either amaranth or quinoa. It’s a bit annoying, but in these chocolate bars the popped grains are pretty great. Together with the nuts they add a lot of crunch and texture. I give Ritter Sport a huge thumbs up for the amount of roasted nuts and popped grains they crammed into these bars. Whoever came up with the recipe for this chocolate isn’t a stingy person. As for the chocolate taste I think it is great that these bars have so much additional stuff going on. The roasted nuts are fantastic, they add so much flavour and texture. The popped cereal is really nice, too. But unfortunately I have to admit that I didn’t care too much for the chocolate itself. It is hard to describe but I didn’t find it very balanced. I thought the chocolate flavour itself was a little bit too sweet and too bitter at the same time, if that makes any sense. One of my coworkers described the chocolate as tasting a bit like raw chocolate. And that hit the nail on the head I think. (No offense if you love raw chocolate. But it’s just not my cup of tea.) I personally would have wished for a milder, more mellow chocolate. Especially because they added hazelnut mass, I would have expected the chocolate to taste a little bit more like gianduia. A hint of milk chocolate would have been great, too. There are already a lot of regular vegan semi-sweet chocolate on the market. I had to choose I probably wouldn’t necessarily go for the Ritter Sport bar. My husband on the other hand and a couple of coworkers really liked the chocolate. The almond amaranth bar in the purple packaging was the most popular one. Ritter Sport chocolate bars are not labeled fairtrade. I usually buy fair-trade chocolate and I love to know where the processed cocoa comes from. I know that fairtrade labels can be problematic though. Especially since the practice of mass balancing makes it possible to mix fairtrade and non-fairtrade produce. Many fairtrade chocolate bars have an additional note printed on their packaging informing the consumer that the chocolate was produced by using mass balance. Which simply means that you have no idea to what extend the product was made using fair trade cocoa beans. 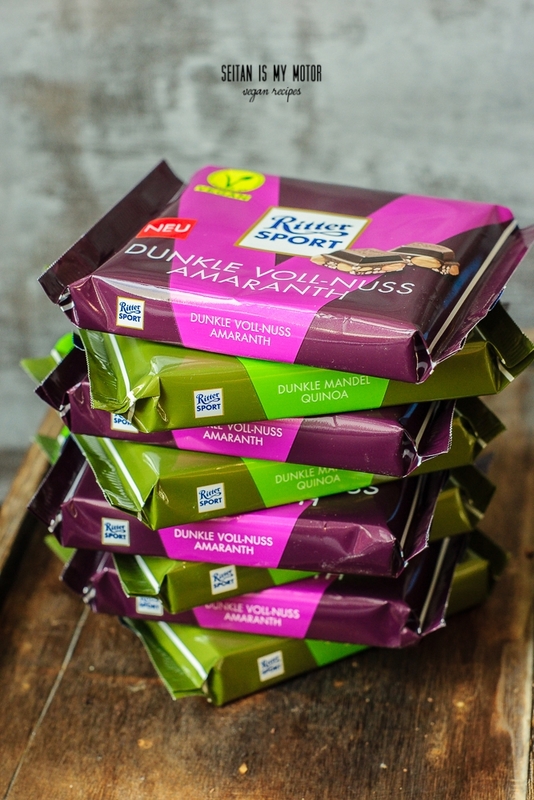 According to a German article from 2013 Ritter Sport buys most of their cocoa at the stock market. Half of this cocoa is grown in Ivory Coast. 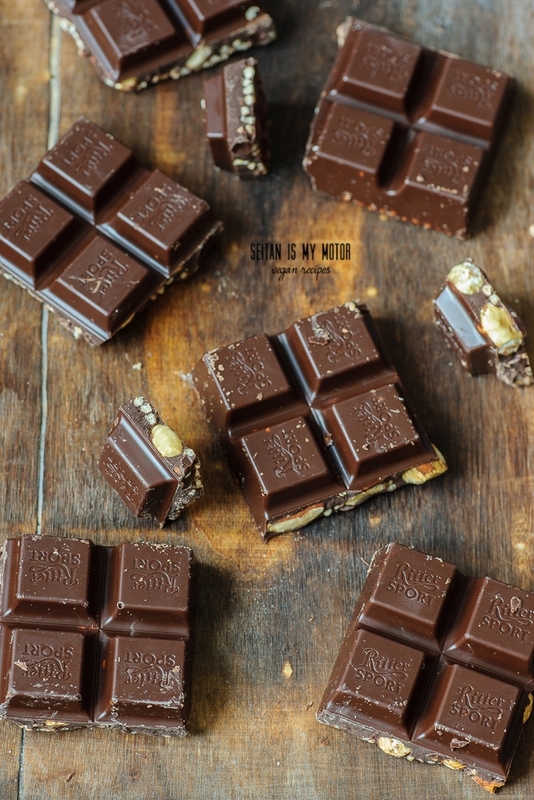 For these two new bars on the other hand the cocoa is harvested in Nicaragua. There they have their own plantation and claim to “pay above the minimum wage in Nicaragua guarantee fair and safe working conditions“. The chocolate for these bars is not from that plantation though, because the first harvest their will probably be next year. At the end of the article the company mentions that they have been supporting small farmers in Nicaragua for several years now and they have some additional information on their website. So far these new bars aren’t listed on their English version of the website and I don’t know when or if they will be available outside of Germany. Here you can find them at grocery stores or at Ritter Sport’s own online store. Our daughter lives near the Ritter factory in Waldenbuch, Germany and sent me Ritter’s two new vegan chocolate bars, which have almonds or hazelnuts. and popped amaranth or quinoa. I don’t have any of the Ritter open now, so I don’t which one I liked best. I know that I liked one more than the other. I know that I’m looking forward to seeing them here in the United States, I’m any case. They have just arrived in Singapore and I must say the purple one is the best I have ever tasted of vegan chocolate. I had tried many varieties of vegan chocolates but none really impressed me. I prefer dark chocolate over milk chocolate, so the bittersweet chocolate suits me very well. Am going to buy a lot more to give to my vegan friends. Thanks. I love having some of the popped grains in chocolate. I am not a huge Ritter fan, I guess there just aren’t that many options here in the states? Plus, as you mentioned, I try and stick with fair trade chocolates and ones that are open about where they get their beans. Oh I’m jealous! Here in the states it’s very hard to get the non-dairy versions of the original Ritter Chocolates. We have to go to speciality shops that sell European imports since the ones in the US are filled with dairy. I hope we can find these imports too soon. They don’t have that many dairy free versions in general as opposed to other brands, especially organic ones. We have their marzipan bar here, will keep an eye out to see if these ones roll out. 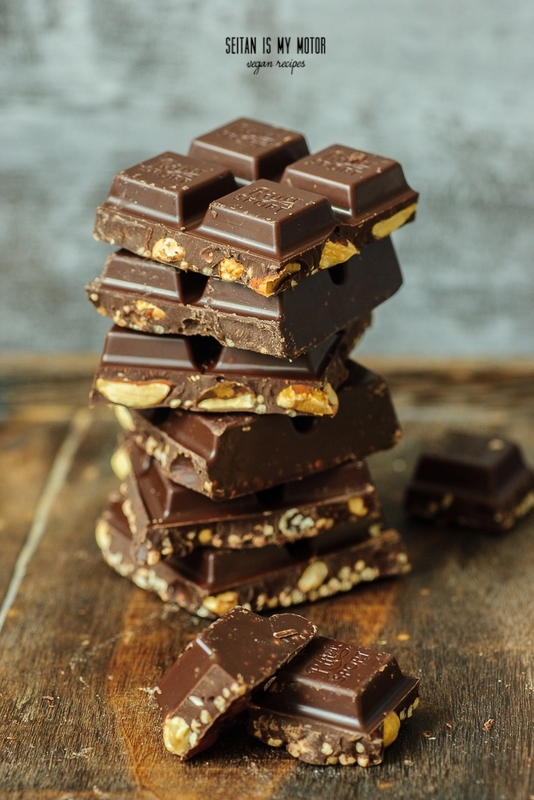 Ich probiere mich auch seit einer Weile durch die vegane Schokoladen-Landschaft und kann nur sagen: die mit abstand beste dunkle Schokoldade ist meiner Meinung nach die “Lindt 70% Edelbitter Mild”….leider nicht ganz so preiswert….dafür ein kulinarischer Höhenflug! I’m with you on buying fair-trade / ethically sourced chocolate – I haven’t bought Ritter for many years for that exact reason. The amaranth bar sounds good though and I hope that they’ll move towards more ethical sourcing for all of their chocolate soon. Ah, das ist gut zu wissen, dass man jetzt auch in nem normalen Supermarkt (theoretisch jedenfalls) vegane Nussschoki finden kann. Das hat mir immer gefehlt (über das mangelnde Angebot an Minzschoki reden wir mal nicht). Danke für deine ehrliche Meinung dazu. Rohkostschokolade ist nicht so ganz meins, weil oft auch die Säure ziemlich durchkommt, aber probieren werde ich es mal. Ich weiß was du meinst. Säure kommt hier nicht durch. Oh they have to bring these to the UK. I love the marzipan bar but I look longingly at the whole nut bars. These look great!